Processing of crushed stone for use as construction aggregate consists of blasting, primary and secondary crushing, washing, screening, and stockpiling operations. (1) Quarry by-products are produced during crushing and washing operations. There are three types of quarry by-products resulting from these operations: screenings, pond fines, and baghouse fines. The exact quantity of quarry by-products that are being recycled is not known. Very little of the 159 million metric tons (175 million ton) produced annually is thought to be used, especially the pond fines. In a recent survey, three states (Arizona, Illinois, and Missouri) indicated that quarry by-products have been used as an embankment material and three other states (Florida, Georgia, and Vermont) indicated some use of quarry by-products in base or subbase applications. (4) Some use has been made of limestone screenings as agricultural limestone, and baghouse fines from quarry sources have been used as mineral filler in asphalt paving. Virtually all of the quarry by-products generated are disposed of at the quarry source. Screenings are stockpiled in a dry or damp form. Pond fines are conveyed in slurry form to settling ponds. Baghouse fines are usually sluiced into settling ponds. Quarry by-products are available at over 3,000 stone quarry operations located in every state except Delaware. Screenings are readily available at most quarries, especially limestone quarries. Although large quantities of pond fines are produced, they must be reclaimed from the ponds and adequately dewatered before they can be considered suitable for use. Baghouse fines are only produced at dry processing plants in areas where there is a lack of market for washed aggregate products. These areas are usually in the more arid regions of the country in the western states. At most quarries, screenings are stockpiled separately at or near the primary or secondary crushing equipment. Screenings are essentially a damp, silty, sand-sized material, usually with an estimated 5 to 10 percent moisture content, depending on the length of time the screenings have been stockpiled. The material is easily recovered by using standard excavation equipment and dump vehicles for loading and hauling. 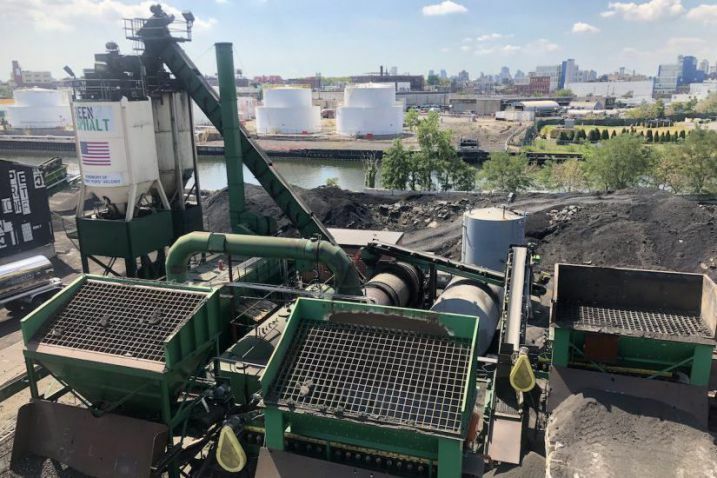 Screenings have properties that are suitable for use as an aggregate substitute in Portland cement concrete, flowable fill, and asphalt paving applications. Baghouse fines and/or pond fines could potentially replace much of the fines in flowable fill mixes, depending on strength requirements, which are usually fairly low. If properly blended, screenings can potentially be used in granular base courses. Quarry baghouse fines have been successfully used as a mineral filler in asphalt paving. Dewatered pond fines have the potential for use as a mineral filler in hot mix asphalt paving, depending on the clay content of the pond fines. Screenings are a uniformly sized, fine, sandy material with some silt particles. Screenings commonly range in particle size from 3.2 mm (1/8 in) down to finer than 0.075 mm (No. 200 sieve). Normally, the percentage of particle sizes finer than 0.075 mm (No. 200 sieve) is 10 percent or less by weight. Stockpiles of screenings may contain some particles up to 4.75 mm (No. 4 sieve) in size, which is usually the screen size used for separation. Some weathered rock or overburden material may be present in the screenings from certain processing operations. Table 1 compares the particle size distribution of the fines fraction (finer than No. 4 sieve) of screenings from several different aggregate sources. Different types of crushers were used to produce these screenings. Despite differences in rock types and crushing machinery, the gradings of the resultant screenings are quite similar. Pond Fines Pond fines, when initially recovered from the pond, consist of a low solids content, fine-grained slurry, usually with 90 to 95 percent of the particles finer than 0.15 mm (No. 100 sieve) and 80 percent or more of the particles finer than 0.075 mm (No. 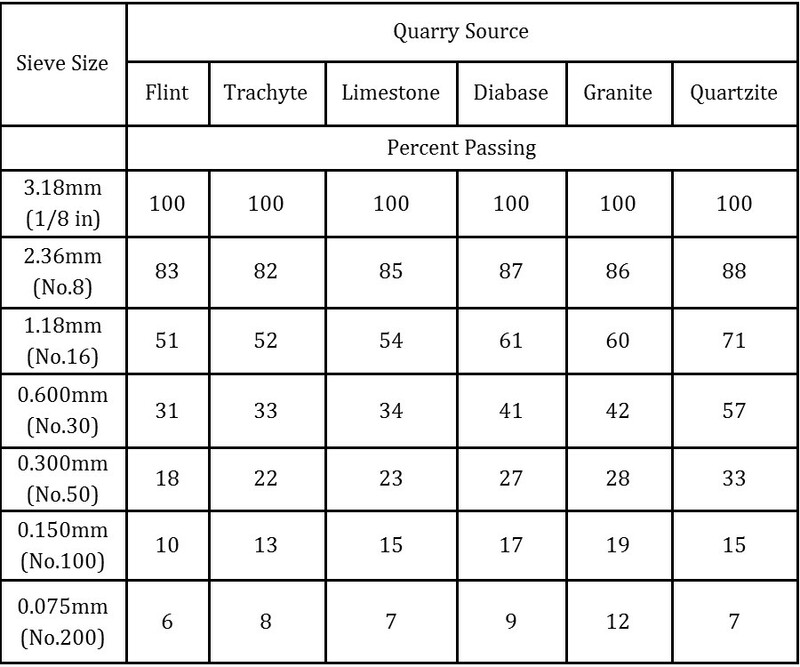 200 sieve).Table 2 compares the average particle size distribution of pond fines sampled from two quarries using two different dewatering processes (a sand screw and a U.S. Bureau of Mines dewatering unit). Table 12-2 also includes a listing of gradation ranges for each of the pond fines samples. The table records particle sizing from 0.6 mm (No. 30 sieve) down to the 0.045 mm (No. 325 sieve) size. 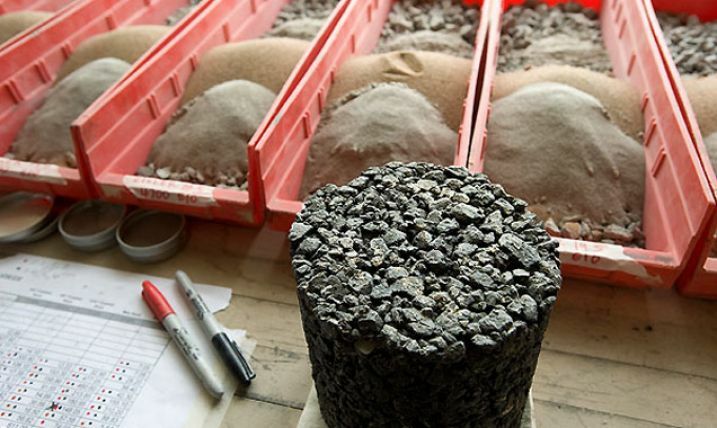 Within this size range, the grading of the samples is fairly consistent. There is very little difference in the chemistry or mineralogy of screenings and pond fines from the same quarry or rock source, and also very little difference in the chemistry within the size fractions of the pond fines. (5) Table 4 provides a listing of the chemical and mineralogical constituents of screenings (minus 4.75 mm (No. 4 sieve) material), and pond fines from the same granite quarry. The pond fine components are further subdivided into the overall bulk sample and the portions of the sample that are both coarser and finer than 0.106 mm (No. 140 sieve). Published data on the mechanical properties (unit weight, compacted density, California Bearing Ratio (CBR), shear strength, etc.) of either screenings, settling pond fines, or baghouse fines are not readily available. The mechanical properties of quarry by-products can be expected to vary according to the type of rock from which the by-products were derived. Tepordei, Valentin V. Crushed Stone. U.S. Bureau of Mines Annual Report, Washington, DC, April, 1992. Kalcheff, I.V. and C.A. Machemehl, Jr. "Utilization of Crushed Stone Screenings in Highway Construction." Presented at the 59th Annual Meeting of the Transportation Research Board, Washington, DC, January, 1980. Wood, Sandra A. and Charles R. Marek. "Recovery and Utilization of Quarry By-Products For Use in Highway Construction." Proceedings of the Symposium on Recovery and Effective Reuse of Discarded Materials and By-Products for Construction of Highway Facilities, Federal Highway Administration, Denver, Colorado, October, 1993. Marek, C.R. "Realistic Specifications for Manufactured Sand." Proceedings of the Materials Engineering Congress, Materials Performance and Prevention of Deficiencies and Failures (T. D. White, Editor), Atlanta, Georgia, August, 1992. There are no known commercial applications to date that have made use of quarry by-products in flowable fill applications. However, a report prepared for the National Stone Association identifies flowable fill as a promising application for quarry by-products. (2) Most flowable fill applications are designed for comparatively low in-place compressive strength development (from 340 to 1400 kPa (50 to 200 lb/in2)). The use of quarry by-products (screenings, pond fines, or baghouse fines) to replace some or all of the sand filler or fines is not considered detrimental to the strength development of the flowable fill. It is unlikely that the use of crushed stone screenings as a filler in flowable fill mixes would require any processing since the screenings are produced dry or slightly moist and are generally stockpiled in the same manner as crushed stone or sand and gravel. Minimal sizing on a vibratory screen may be needed if there are any oversize (plus 19 mm (3/4 in)) particles in the screenings. If screenings are stockpiled during a rainy period, some drying may also be necessary. The use of pond fines as a filler in flowable fill will require some type of dewatering once the fines have been reclaimed from a settling pond. The pond fines may be stockpiled for natural dewatering or passed through a mechanical dewatering device (such as a hydroclone or belt press) to reduce the moisture content. 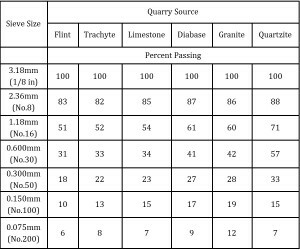 Some of the engineering properties of quarry by-products that are of particular importance when quarry fines are used in flowable fill mixtures are gradation, moisture content, and unit weight. Gradation: Gradation is important from the perspective of comparing the gradation of commonly used flowable fill materials (such as fly ash and sand) with potential replacement products. Screenings are nearly all finer than 3.2 mm (1/8 in) and have low percentages (6 to 12 percent) below a 0.075 mm (No. 200 sieve) sieve size. This indicates that screenings are basically well-graded, medium to fine sand-sized materials with a small amount of silt-sized particles. Recovered pond fines can be expected to have a size range from 100 percent passing 0.59 mm (No. 30 sieve) down to between an average of 75 to 90 percent passing 0.075 mm (No. 200 sieve). This is essentially the same size range as coal fly ash (a common additive in flowable fill mixes), which is a predominantly silt-sized material. Baghouse fines are all finer than 0.075 mm (No. 200 sieve) and nearly all particles are also finer than 0.045 mm (No. 325 sieve). Baghouse fines are nonplastic and similar in sizing and consistency to a finely sized fly ash. Moisture Content: Screenings, because they are stockpiled in the open, can have a fairly wide range of moisture content within the same stockpile or from one quarry location to another. Pond fines, when reclaimed, may have moisture contents as high as 70 to 80 percent, and must be dewatered, either by stockpiling or by processing. Baghouse fines are available as a dry powder. Unit Weight: The unit weight of quarry by-products can vary according to the type of rock processed, but is expected to be within the same range as the rock source from which it was derived. Screenings will normally have a higher unit weight than pond fines, with baghouse fines probably being slightly lower in unit weight than pond fines. Some of the flowable fill mix characteristics of interest include mix strength, flowability, time of hardening, and bleeding and shrinkage. Mix Strength: Strength development in flowable fill mixes should not be affected to any great extent by the use of quarry by-products. In mixes with high fly ash content, ultimate strengths in excess of 1035 kPa (150 lb/in2) may require jack hammers if removal is necessary. (3) Use of pond fines or baghouse fines in lieu of some of the fly ash should help to maintain the strength development below this value because the pond fines or baghouse fines are not pozzolanic. On the other hand, if additional strength is required, screenings used in place of all, or a portion of, natural sand should not be detrimental to strength development since quarry screenings are a manufactured sand from the crushing of rock. The particles are mostly angular with good interlocking characteristics and a relatively high angle of internal friction, similar to or possibly even higher than that of natural sand. Flowability: The use of quarry fines may have an effect on the flowability of a flowable fill mix, depending on the type and amount of quarry fines that are used. The use of pond fines, or baghouse fines, in place of a portion of the mix may cause the mix to be somewhat less flowable at the same moisture content, because of the angularity of the particles of quarry by-products compared with the spherical shape of fly ash particles. Somewhat lower flowability may also occur when using screenings instead of natural sand. To maintain or improve flowability, additional water and/or other additives (such as coal fly ash, which enhances the flowability of the mix) may be needed. Although chemical admixtures (such as water reducing agents) are not ordinarily added to flowable fill mixtures, the use of an appropriate admixture may also help to improve flowability. Time of Set: Setting time for flowable fill mixes is determined mainly by the cement and water content of the mix, as well as atmospheric conditions. The use of quarry by-products in mixes is not expected to adversely affect the normal setting time of flowable fill mixes in which they are used, provided the cement content of the mix is not altered. Similarly, if pond fines or baghouse fines are used, the time of set should also not be adversely affected as long as the amount of cement in the mix and the water-cement ratio remains essentially the same. In most cases, flowable fill mixes are designed on the basis of a given strength criterion, not on prescribed amounts of ingredients. If quarry by-products are incorporated in these mixes, then specific mix designs will need to be prepared to establish design criteria. The increased fines content in a flowable fill mix when pond fines or baghouse fines are used may require an increase in the water content and/or cement content in order to ensure a flowable mix. (5) With little or no fly ash in the mix, its flowability is likely to be noticeably reduced. Flowable fill mixtures are usually designed on the basis of compressive strength development, generally after 28 days of ambient temperature curing, but sometimes on the basis of longer term (90 days or more) strength. They are usually designed to have high fluidity (typical slump of 150 mm (6 in) to 200 mm (8 in). In many applications, especially pipe trench backfills where future access for repairs may become necessary, a maximum unconfined compressive strength (usually in the 690 kPa (100 lb/in2) to 1035 kPa (150 lb/in2) range) is the design criteria. For structural support applications, such as abutment backfills supporting bridge approach slabs, the design criteria may range from 4140 kPa (600 lb/in2) to 8280 kPa (1,200 lb/in2). When using screenings to replace all or part of the natural sand in flowable fill mixes, the amount of Portland cement and fly ash used should remain essentially the same. The overall density of the flowable fill mix should not be too different when using screenings, since the screenings have a density that is in the same range as natural sand. Some additional water may be needed, compared with the sand mixes, to achieve a desired range of flowability. If pond fines or baghouse fines are to replace part or all of the pozzolan, such as fly ash (in high fly ash content mixes), it is possible that a small increase in the amount of Portland cement in the mix may be needed in order to achieve a desired level of compressive strength. The pond fines or baghouse fines may be somewhat denser than fly ash, resulting in a somewhat increased mix density. Some additional water may also be needed to maintain the desired range of flowability. Structural design procedures for flowable fill materials are no different than geotechnical design procedures for conventional earth backfill materials. The procedures are based on using the unit weight and shear strength of the flowable fill to calculate the bearing capacity and lateral pressure of the material under given site conditions. The same general methods and equipment used to handle, store, and stockpile conventional aggregates are applicable for quarry by-products. Flowable fill can be produced at a central concrete mixing plant in accordance with ASTM C94(6) and delivered by concrete truck mixers or using a mobile, volumetric mixer for small jobs. It is important that high fluidity (slump greater than 150 mm (6 in)) be maintained to ensure that the flowable fill material entirely fills all voids beneath pavements and around structures and utilities. Quarry by-products are basically untried in field flowable fill applications. Experience is needed in the design, placement, and performance of flowable fill mixes containing different sources of quarry by-products, including some mixes with coal fly ash. Data are also needed on long-term strength development, flowability, and other engineering properties of such mixes. Collins, Robert J. and Samuel S. Tyson. "Utilization of Coal Ash in Flowable Fill Applications." Proceedings of the Symposium on Recovery and Effective Reuse of Discarded Materials and By-Products for Construction of Highway Facilities, Federal Highway Administration, Denver, Colorado, October, 1993. Kumar, D.S. and W.R. Hudson. Uses of Quarry Files for Engineering and Environmental Applications. Report for the National Stone Association, Washington, DC, October, 1992. Smith, Ann. "Controlled Low-Strength Material." Concrete Construction, May 1991, pp. 389-398. Brewer & Associates. An Assemblage of Five Research Reports on the Subject of Controlled Low Strength Material (CLSM). Technical Reports Prepared for the Cincinnati Gas & Electric Company, Cincinnati, Ohio, June, 1992. Kumar, D.S. and W.R. Hudson. "Potential Uses for Quarry Fines." Stone Review, Volume 9, No. 2, National Stone Association, Washington, DC, April, 1993, pp. 12-14. American Society for Testing and Materials. Standard Specification C94, "Ready-Mixed Concrete," Annual Book of ASTM Standards, Volume 04.02, West Conshohocken, Pennsylvania, 1993. ASTM Provisional Standard 28. "Provisional Test Method for Flow Consistency of Controlled Low Strength Materials," American Society for Testing and Materials, West Conshohocken, Pennsylvania. ASTM Provisional Standard 29. "Provisional Test Method for Unit Weight, Yield, and Air Content (Gravimetric) of Controlled Low Strength Material," American Society for Testing and Materials, West Conshohocken, Pennsylvania.